It took me a while to figure this out, but I now know that a restaurant review is best administered at the three month mark. Sure, it’s fun to be among the first fleet of people sinking their teeth into the newest thing. But, when it comes to restaurants, there should be, at least, a three month grace period to allow the new eatery to find it’s sea legs, to transition from Bambi on ice to a full fledged deer, proudly overlooking the forest below. But within its inaugural week of existence I was bombarded with rave reviews for Supply and Demand. Recommendations and suggestions for dishes that I “must try” were being doled out and murmurs of “best dish” were being uttered. Screw the grace period, I thought, I better get myself to this place ASAP. It was clear that Supply and Demand didn’t need a grace period to adjust. Bambi was born with skates on. So about a month ago, on a Friday, at noon, I called to make a reservation for four people, to no avail as they were fully booked until 9:30 pm. I’m all for European dining habits, but 9:30 pm was pushing it. 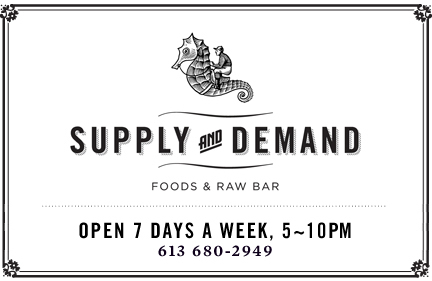 The following week I tried again, only to call up a quartet of disappointed diners to explain that, apparently, all of Ottawa was eating at Supply and Demand and we were the only ones in the city who didn’t make the reservation cut. Desperate measures were taken and I whittled down my dinner party from four to two and decided upon a less popular eve for dining, a Tuesday. Success! I secured a reservation squeeeeezed in a reservation for 8:15 pm. Hallelujah. So here we are, still a solid three months after Supply and Demand opened their doors to the public, and I have finally experienced Steve and Jennifer Wall’s first born creation and haven’t told you anything about it. Well, that might be a slight exaggeration, but I have to say the food, wine and drink has landed Supply and Demand in the position of “best meal I’ve had in a really long time” and although it was on the pricey side, it was worth every penny. We started with oysters. And really??? Oysters are oysters. But these particular bivalve mollusks were accompanied by (alongside the traditional horseradish and lemon) two pickle juices: one infused with dill, the other with sweet and spicy chili. Both juices complemented the oysters in different ways- one livening the briny taste of the sea , the other masking it with layers of sweet and savoury. Following, we tried the duck tartare, prepared in classic tartare style and seasoned to perfection with capers, purple mustard and corn nuts. This dish is what my dining partner dubbed as “best dish”. The kale salad, not something I would habitually order, was a recommendation that I devoured. Think: caesar salad on steroids. Covered in mounds of manchego cheese and enough bacon to serve a jam-packed greasy spoon, I’m not sure the word “salad” should even be included in it’s description. DELICIOUS. Another delight- as if I needed any more convincing that this spot is unbeatable- was the wine list. It was versatile, funky, balanced and affordable. With a notable selection of quality Niagara wines (we had the Hidden Bench Pinot Noir), Wall also hasn’t shied away from oddball wines daring to include something like an Assyrtiko (a personal favourite of mine). Cocktails should be noted too, giving places like Union 613 a run for their money in creativity and quality. In a nutshell though, most dining experiences are situational. A bad server can be overlooked, if the company you keep is stellar. Your expectations, mood and hunger going in are all factors that affect how you perceive what that restaurant was able to deliver. And it very well could be that Mr. Steve Wall has hit the nail on the head with Supply and Demand … or it could be, simply, that I set out to have a really, really good time that night. 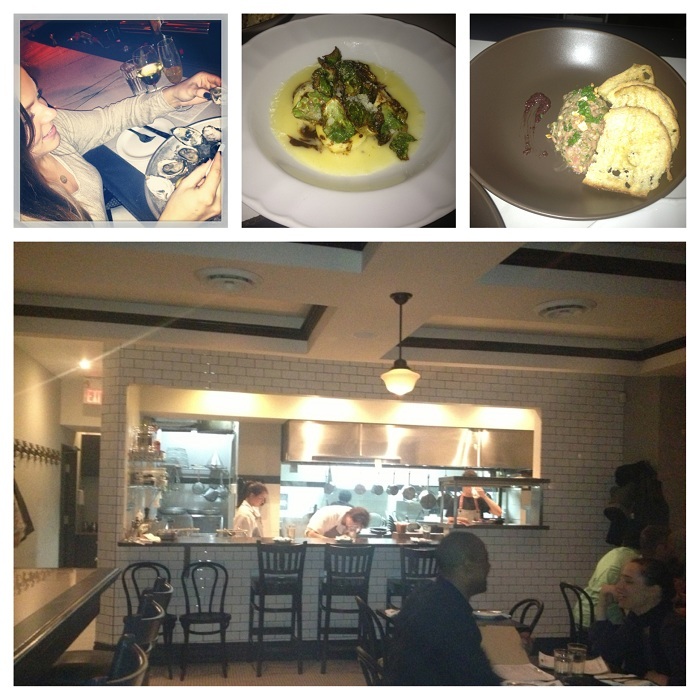 Yes, we were one of the early diners, and I did write a blog post about how much I adored it! Sounds like you had a really good night!